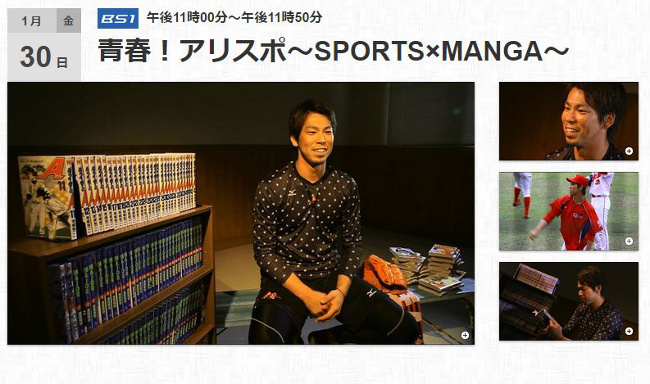 A 50-minute TV special about baseball manga with a focus on Hiroshima Carp pitcher Kenta Maeda (前田 健太) is scheduled to air on NHK BS1 this Friday (Jan. 30th). It will be presented by Alice Hirose (広瀬 アリス) and it’s actually the second program in this series she has hosted. The first aired last year and focused on tennis manga such as Aim for the Ace! and The Prince of Tennis as well as current tennis player Kei Nishikori (錦織 圭) and former player Shuzo Matsuoka (松岡 修造).